Being able to access your important documents with you is a feature of the iPad that is enjoyed ever day. There are many ways to grab data from your computer and make it available to view and use on your iPad at a another time and place. This can be meetings notes, power points, spreadsheets and even Web sites (for offline reading). Most of the methods we have covered is moving documents through the cloud. Which has resulted in a few emails to us about some companies not feeling safe with their files out on a third party server. This can be true with important documents around the house that carry personal information. A option is to ‘print’ to your iPad. ACTPrinter is a free app that resides on your Mac (no PC option yet). When you have a document of just about any time you want to use later on your iPad, you ‘print’ that document. 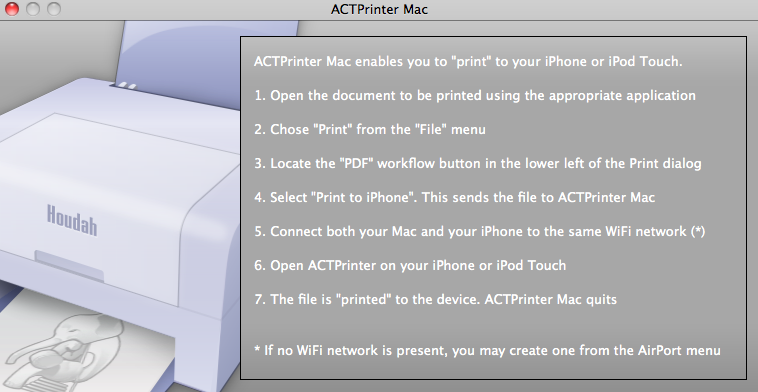 ACTPrinter adds the option in the print PDF pull down to ‘Print to iPhone’. 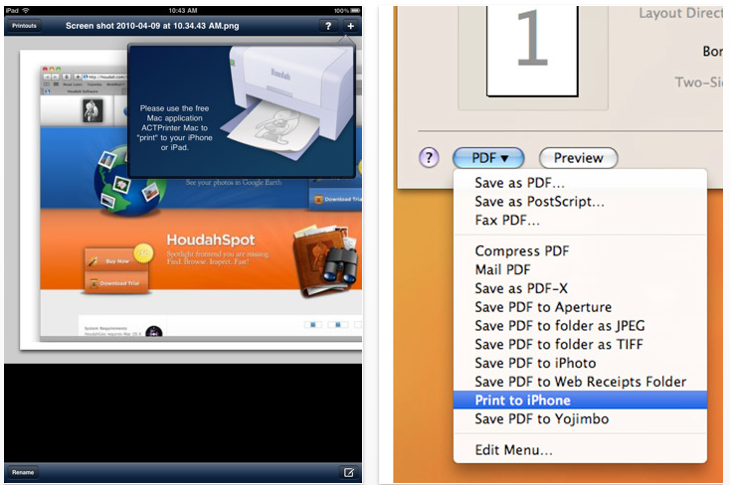 Choosing this converts your documents to a PDF and loads it into their desktop app to send to your iPad. Launching the iPad app, not free but very inexpensive, it connects to the Mac app and downloads the files into your iPad to use later. No need to put the files out to a external server or Web site, it goes directly from your Mac to your iPad. The documents are then readable on the screen to reference later. The ACTPrinter app on the iPad can also allow your documents to be read on other apps you may have installed such as GoodReader since you may have a favorite with features you enjoy. As well, ACTPrinter can view PDFs you have currently in other locations on the iPad like sent to you via eMail. It keeps your files local to you without a outside party getting involved.